Welcome back to the second in my series of Home Organization posts! Previously, I shared how to declutter and store your holiday decor and wrapping supplies. Today I am going to tackle the dreaded paint closet. 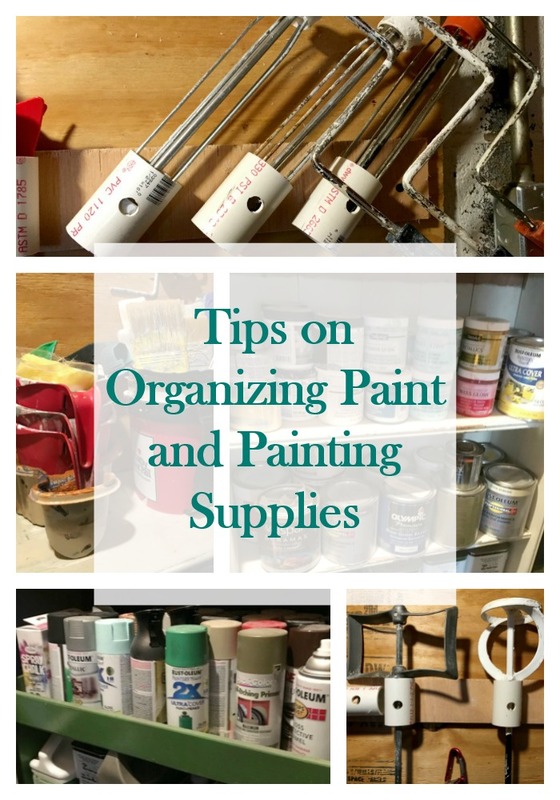 If you are a DIYer like me, you probably have a ton of paint cans, jars, and sprays in several sizes. Not to mention, you also have all the related supplies such as brushes, rollers, roller holders, poles, pans, and cups! We are lucky enough to have a closet area under our basement stairs to store these in, but how do I keep it organized? 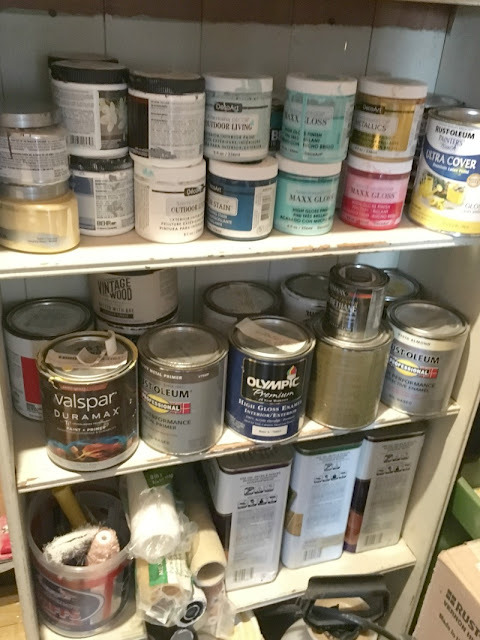 Before we began our basement renovation two years ago, I purged this area of all the paint left by the previous homeowners that was dried up. 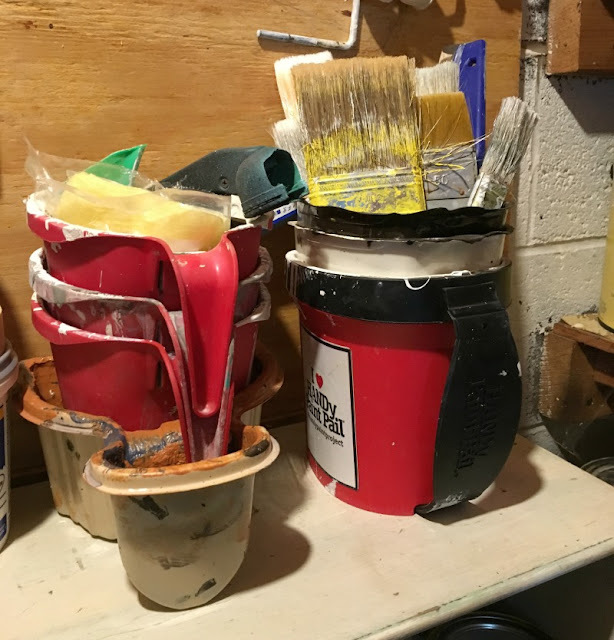 I also re-purposed an old bookshelf to hold my small jars of paint and brush supplies, but during the basement reno the closet had gotten out of control. 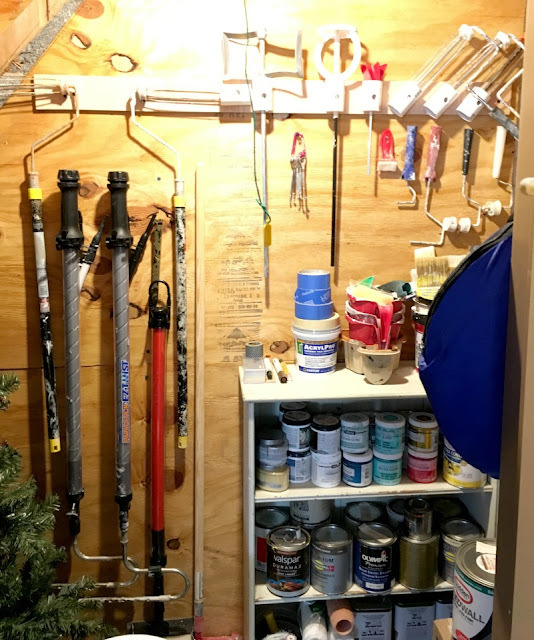 Since that is where we also keep our Christmas tree and wreaths, we took this opportunity to organize the space before putting those items back under the stairs. 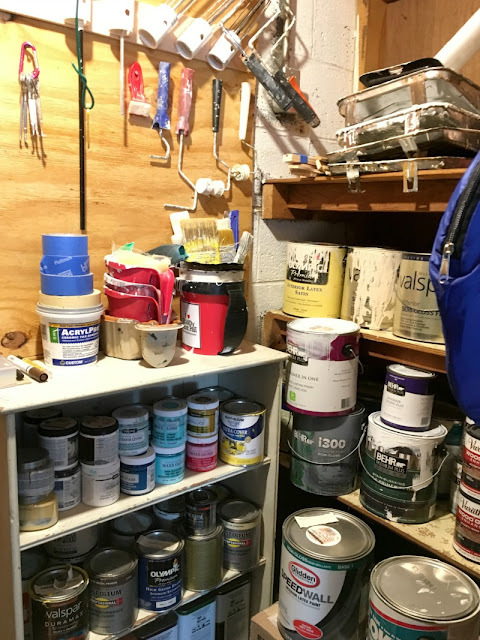 The closet has built in shelves on the right hand side so we use those to store the gallon sized paint cans and stacked metal paint trays. I also have some of the quart cans that would not fit on the book shelf. There was a pretty big area under the shelves where I store my spray paint cans. The previous owners also left a mini wooden cart/shelf that slides perfectly under the open space and holds my spray paint on the top shelf. 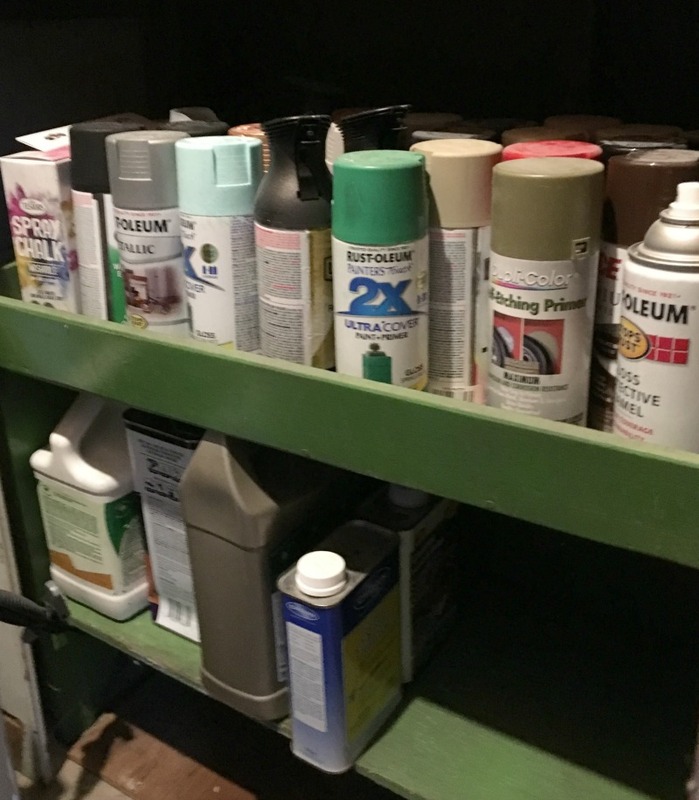 The bottom shelf is used to store the paint thinner and mineral spirits. I screwed the old bookshelf to the wall cause it was kind of rickety and I use it to hold my small sample sized jars and quart cans of paint and stain. I also stack our extra roller covers on one of the shelves. 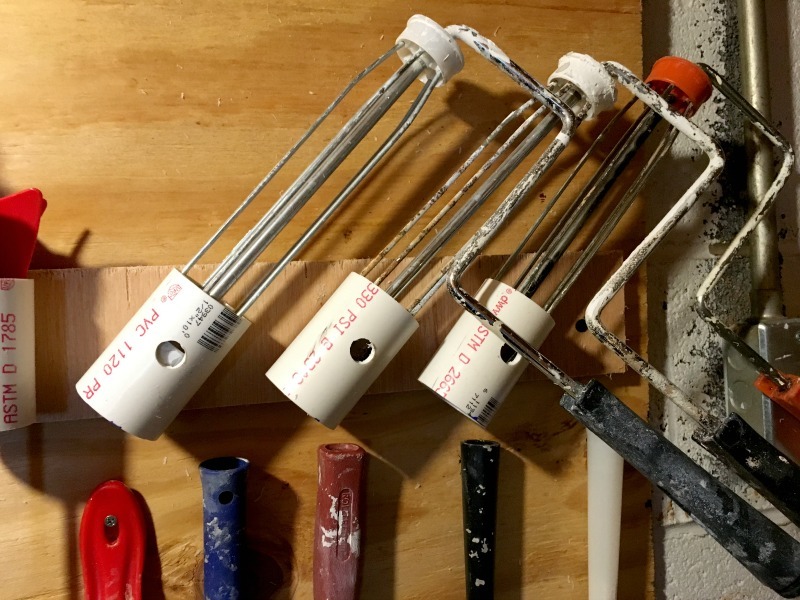 I store the paint cups and brushes stacked together on the top of the bookshelf. I need to make some kind of contraption to hold my brushes, but for now this works. 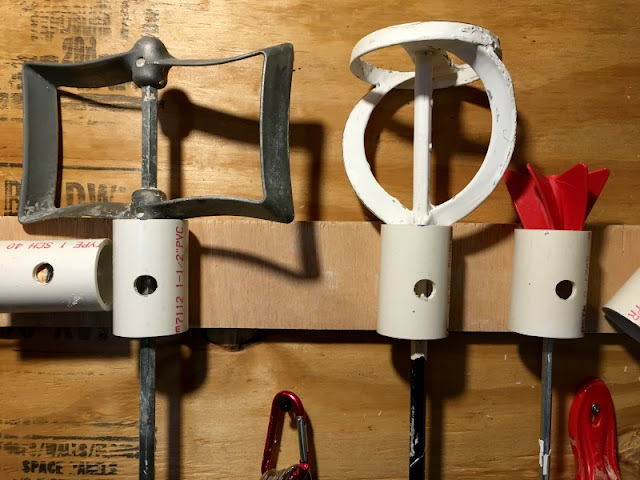 For the mini roller handles, we just hung them on nails above the bookshelf. For the larger, more awkward items like the paint roller handles and large paint poles, my husband came up with a genius idea and used up some of our excess plumbing materials at the same time! 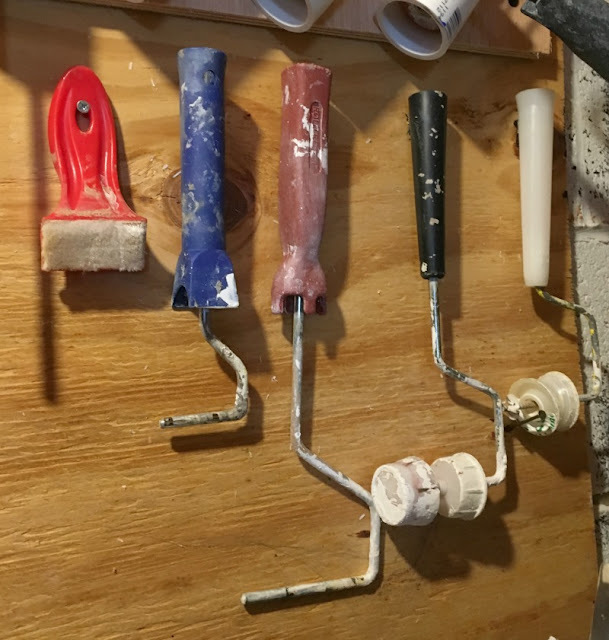 He took a piece of scrap plywood and screwed it into the back wall of the closet. He then attached pieces of plastic plumbing pipe, cut to size, to the board. 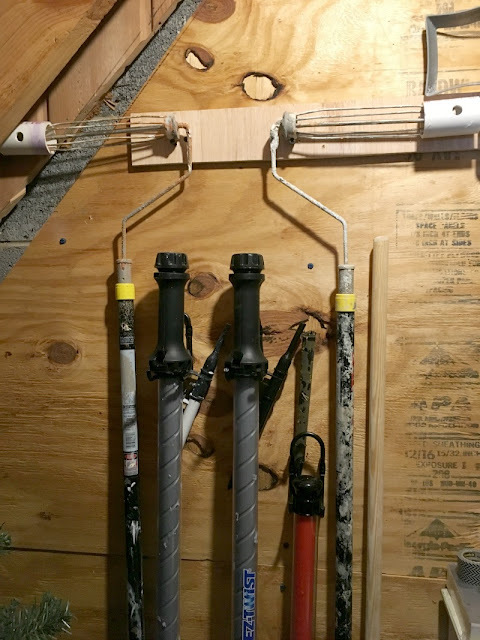 For the roller handles, he screwed the pieces of pipe in at an angle to maximize space. 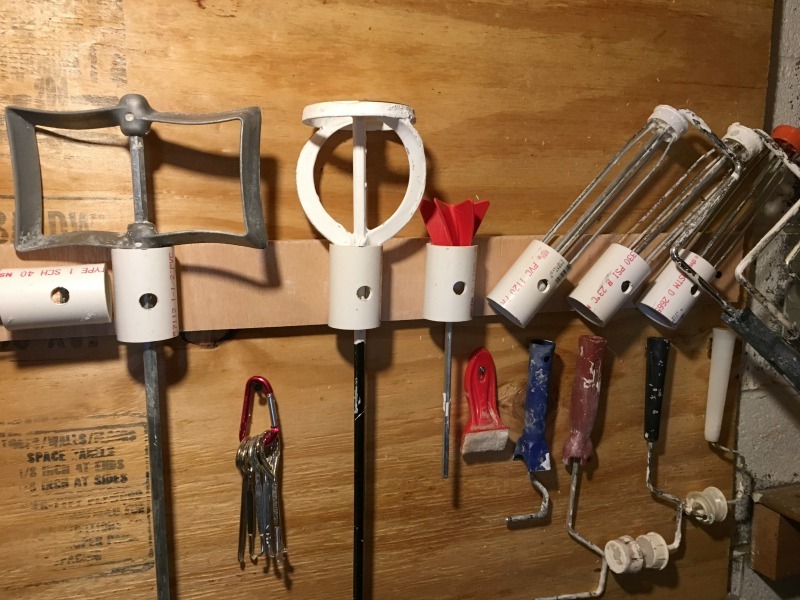 For my larger sized HomeRight EZ Paint Sticks, he used a couple of garden tool hooks shaped like a "double J" to hold them. How smart is this?! I am so happy to start the year off with an organized closet so I can easily find my supplies for my next painting project. Now, we can easily find what we are looking for and everything has a place. What tips do you have for storing your paint supplies? Great tips on organizing these items! My basement is out of control and I really need to build some simple shelving. Under the stairs would be a perfect space to utilize. Thanks for the ideas! I am so glad we have the space under the stairs. It is so handy for keeping things out of the way! Your paint room/closet is equivalent to what my makeup room would look like haha! HA! You are too funny! I need a few paint rollers. All of ours were so bad I tossed them.